It's been months since I shared any Instagram images on here. It will never supersede blogging for me, but I enjoy it enormously, especially on those occasions when I don't have my "big" camera with me. People seem to use Instagram for all kinds of reasons - to promote a business, or to showcase their photography - but I like it most when people use it to make friends and share their hobbies and passions, and to capture and share the everyday in an instant way, and that's how I like to use it too. Sunset. Bowling. The tiled floor in the Natural History Museum. A heart in the clouds. Quilt drying on the line. Children in a maze. A gate on the way to school. Sandals and daisies. Making jam tarts. A messy kitchen. A good day for washing. A sunny spot. Pancakes for breakfast. Sketching. Cake break. Angus turns five. I've been into Leeds three times this month, that's unheard of! Shopping, lunch, theatre, you name it, I've been gallivanting. Map garland. Cake and a new book. Drinks in a friend's garden one evening. The makings of a Victoria sponge. The view from the school playground one hot morning. The kid's playhouse. Garden shadows. Blue skies. Before the theatre. After the theatre. The loom band obsession begins. Father's Day tray. I'm here if you want to come and find me. I love finding blogging friends on Instagram. Come and say hello! Thank you so much for all your recent comments. I feel like I've neglected this space a bit lately. Well, not neglected it, but I don't feel that I'm as "present" as I usually am, if that makes sense. 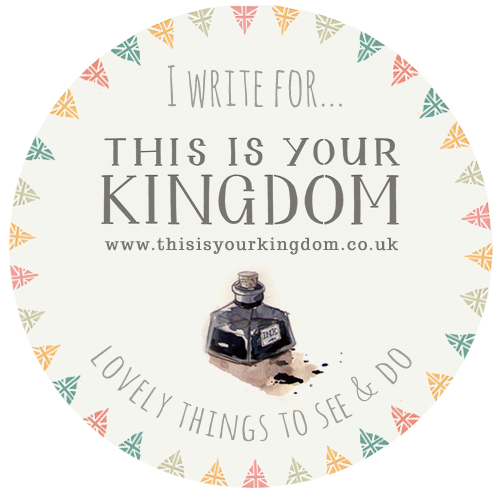 Life is just too hectic at the moment, but it will soon settle down again and I'll have more time to be here, to think, to craft and to visit your blogs too. I don't use instagram but it does appeal to me. I don't use it because, from what I can gather, I have to upload images straight from my phone to instagram but I don't have a good phone camera. Maybe when I upgrade my phone, I'll join in. As long as it's not only for iphones, as I don't do i-anything! I think the hectic life thing is going around, hahaha! I peek in on others while sneaking a sit-down with a cup of coffee, but realized yesterday that I haven't posted in two weeks!! Crazy how fast time goes, and though it is so cliché, it does seem to just go faster and faster - I want a pause button!! All your pictures are lovely. My daughter's arm looks like yours pretty often (covered in bracelets - I would have adored this craft at their age!) Enjoy your season of gallivanting, children, and lovely weather! I didn't know you were on Instagram ! Am following you now :-).... I see some beautiful photos there, which I haven't seen here "in Blogland" ! Ha! Yes, Liz, I think it is a bit like facebook for photos. There isn't really a point to it, it's just fun and another addictive, time wasting device! Love your photos. Glad you are blogging them, as I can't get into Instagram. I find the computer takes up, more and more of my time lately and I know once I satrted, I would become addicted. The more time spent on the computer, the less time for making things. I am so moved by these pictures - such recognisable little scenes that make me pause and enjoy. I do miss all the blogs we lost to Instagram. lovely pictures. I just joined instagram myself. I'm still a little confused but I managed to take the first pictures! How can I find you on instagram? I'd like to follow you! Lovely photos! I think I shall be a little sad when my life stops being as hectic as it is no matter how much I complain. I've never signed up for Instagram but I do see the benefits of taking part. Hope you have a great week. Lovely pics. My favourite row is the 3rd row in May, lovely domestic scenes. Looks like you are enjoying some beautiful blue skies. We don't have Fathers Day here until September. I love that instagram just catches the moment, no pressure for the perfect vignette. Love. Love those blues. I keep thinking I will make a blanket in blues but never get round to it. Maybe some day. 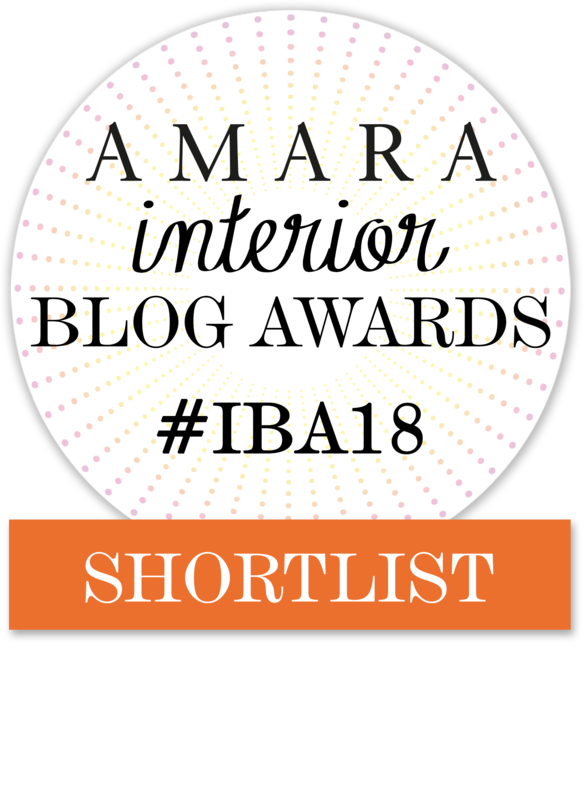 Hope this doesn't turn up twice ... Blogger has hiccups. I was saying that I just can't seem to remember to stop and photograph things unless I went out deliberately intending to do just that. But I do enjoy looking at these kinds of life shared images. I'm really enjoying Instagram in the same way, making friends and discovering beautiful things. I love your feed enormously! 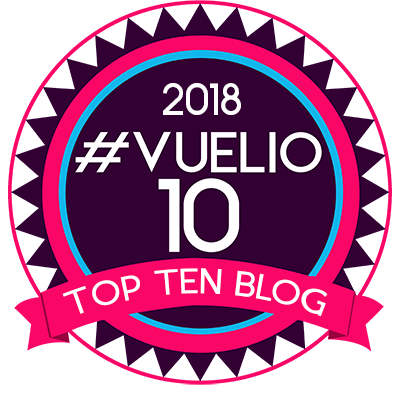 I struggle to blog as much as I did now I work full time and find especially hard in the summer with busy school stuff on, holidays and so much to do outside. Nice problem to have though. 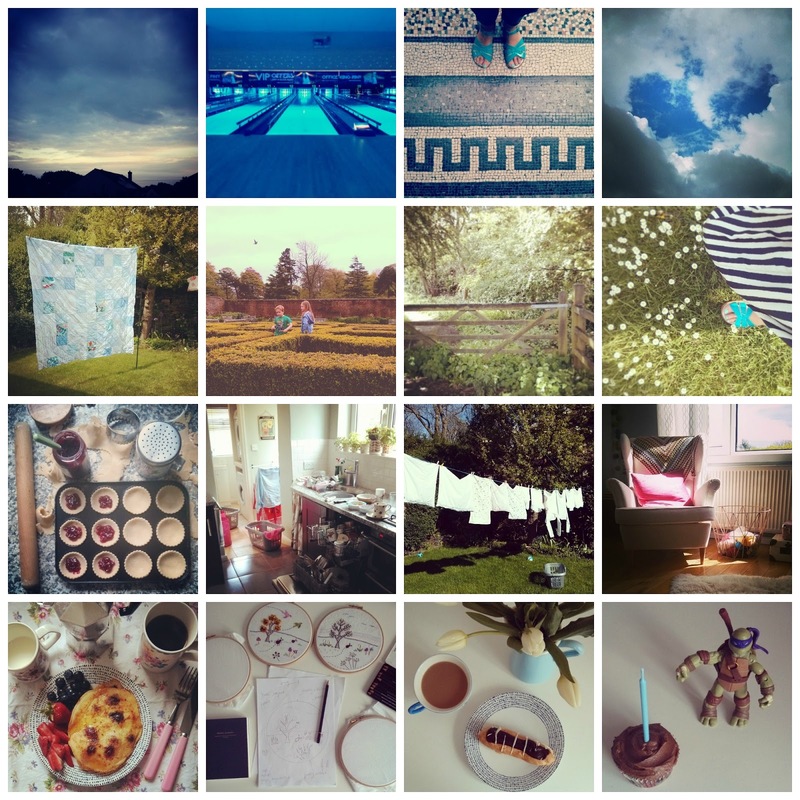 Instagram is perfect for capturing the moment I think, something I love to do x.
Lovely photos! I just started using instagram, and am loving the simple, moments captured each day. Thanks for sharing yours with us. I loved finding your 'snapshot' as I've just done one too - http://stonefruitseason.blogspot.com.au/2014/06/do-you-instagram.html . I've only started on Instagram and am really enjoying it. I've discovered another world of friends who use it that don't necessarily blog. It's like another piece of the puzzle, really, don't you think?! Instagram is wonderful for dipping into a couple of times a day and getting a burst of colour and glimpses into lives of those here, there and everywhere. Blogging will continue for me too, well once my energy levels return. 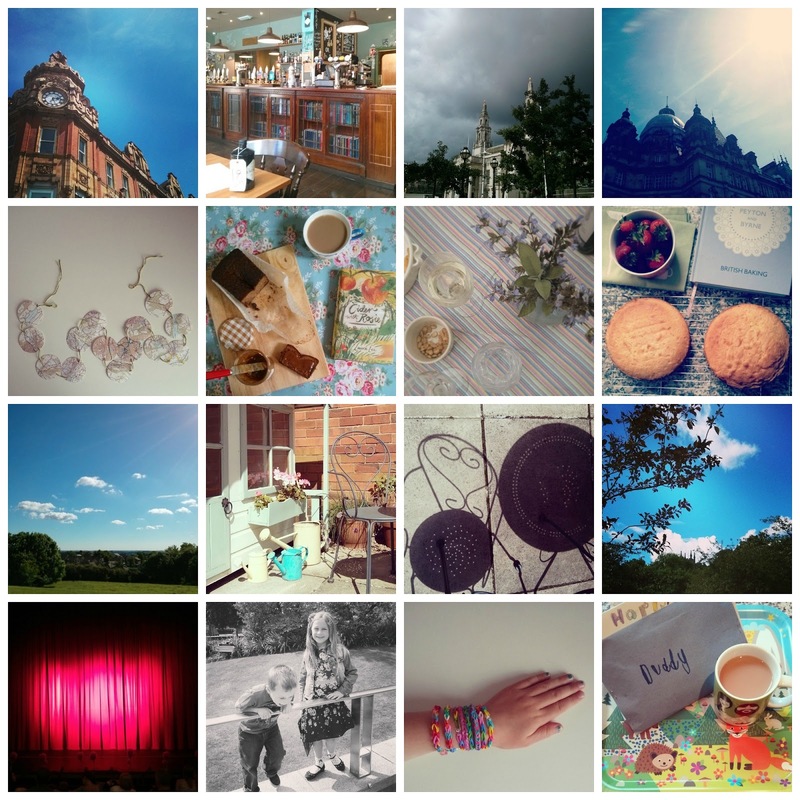 I'm not on Intstagram so it's lovely to see some of your photos here... you have captured some lovely details. Your photos are great as always and I like how you have made them into a collage. Well I for one am glad that your life is hectic, and that you aren't trapped under something heavy. I'm afraid I've become a bit of a IG addict. I love it as a way to chronicle everyday instants. That's how I use it. Not planned or posed. Just point and press. I like the end result. I like it as a collection of life chez me. My blog has been a tad neglected too. I'm doing lots and then flopping into bed with a book. I know exactly what you mean about hectic! I don't want to quit my blog--but so many other things are going on all the time it is hard to fit it in. Not to worry--even if you don't regularly post, I still come around and read eventually. I don't do Instagram but I like the idea of catching a few pictures of everyday life and the way you have put them into groups. Great pics as always Gillian. Enjoy the rest of your (hectic) week.